The Yorkshire Air Museum makes a wonderfully unique and atmospheric corporate event hire facility close by the City of York. Our parkland location in the grounds of the original World War Two air base is easily reached by road and public transport facilities. The Museum is housed in the grounds of the original RAF Elvington airfield, which was home to the only two French Air Force Squadrons to escape from occupied France in World War Two. 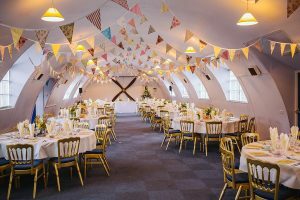 The original, carefully restored wartime buildings make an atmospheric and spacious location for a wide variety of corporate events in York and the surrounding Yorkshire area while combining modern conference and communications facilities. Our highly experienced team have years of experience working alongside businesses, live television broadcasters and other organisations to create exciting events at this historic venue. They have the ability to co-ordinate all of the elements needed to create a successful and memorable event, whether you are searching for a corporate venue, a film and TV location or are planning a special occasion. In November 2016, the BBC's Escape to the Country programme filmed part of their series at The Yorkshire Air Museum. Just a twenty minute drive from York railway station, our location is served by all the main transport infrastructures with free and ample on site parking. High speed rail links give access to York from Kings Cross in less than two hours, while in addition to the neighbouring Elvington airfield, Leeds Bradford airport is 30 minutes drive. VIP coach and car transportation can be arranged to collect your guests. For Further information, to make a booking or to arrange a personal visit to discuss how we can tailor your event to your exact requirements, use our contact form here to send a message, email Sandrine Bauchet @ museum@yorkshireairmuseum.org or call on 01904 608 595.